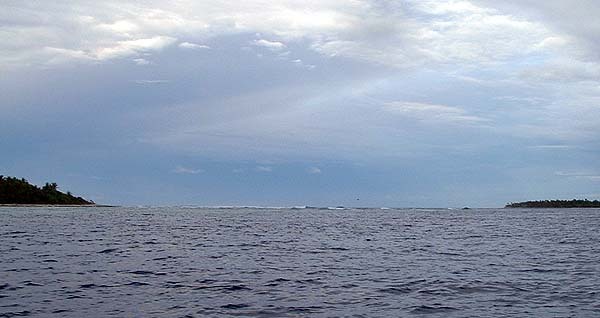 The narrow reef around Falalop. 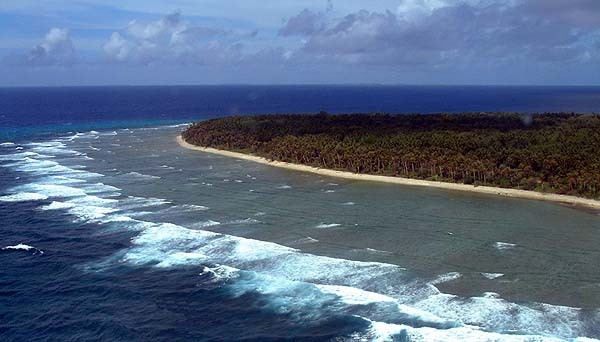 “The reef here is very narrow,” Mariano says, “and there are not a lot of resources on it. Specially for Falalop. And we have reef owners It could be clans, it could be individuals. If it’s an individual, maybe he was given this portion of a reef in return for a specific service to a clan leader or to a chief. But usually it belongs to a clan. That part of the reef belongs to them. This whole island’s reef belong to this certain clan. Then if you want to go fish on this part of the reef, then you have to get permission from the owner, the reef owner. " “The land owner is not always the one who is put in charge for the reef,” Hosey points out. “Let’s say here on Mogmog, if I have my land at the end of the island, the land is for me, but there is a family here that they control the reef. On those uninhabited islands, the ones who controls those islands are also going to control the reefs." The high tide mark. 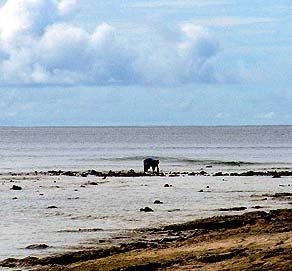 Beyond, the reef is exposed at low tide. 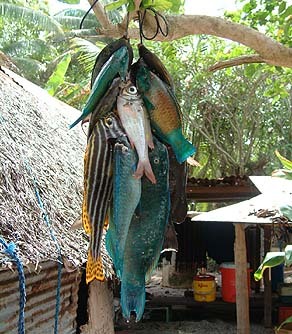 Two fish left as payment (faad) at the home of a reef owner on Mogmog. "There is a family that takes care of that part of the reef. So if you go fishing at that reef, you’re supposed to get your permission from the owner. Those that they are watching over the reef. So we just go out to those areas and fish from there. "When you fish at certain fishing grounds," Chief Taithau confirms, "you have to put two fish on a string for the owner of that particular fishing ground. 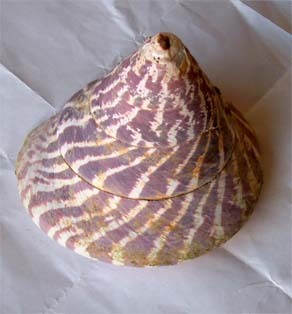 You give that to the owner, the clan, of that fishing ground." “We catch the fish inside the rocks on the reef, during low tide,” Lourdes says. “This is a woman’s job. We like to catch fish. Nowadays a woman can go fishing, but before, no. "Before, we would take the rib of the coconut leaf, from the coconut tree, and we’d take it and make a noose. 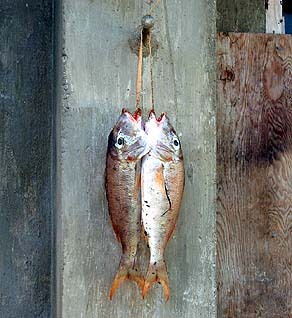 Then when we see the fish—they would hide—we’d take this noose and tie some bait. And then you take the stick. We pull this noose, and poke in that stick, and take out the fish. 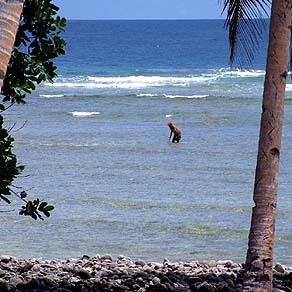 A woman fishes on the reef at Falalop. “Now, when it’s trochus-hunting season, then you just go anywhere,” Mariano says. “It’s ‘open season.’ But not to fish. To hunt for trochus, but not to fish. If you go to each island you have to go to the man’s house and report the purpose of your trip to that particular island. Now, during trochus season, you can just come and go to this end of this reef and start looking for trochus. "Why? I think because we understand that the trochus is not naturally here. It was introduced by the Japanese. So we have a sense of not owning the trochus. The trochus is here for everybody." “But the fish is there for the reef owner. So during trochus season you just take your boat, canoe, whatever and you just go inside looking for trochus. But if you happen to catch a fish, you better hide it! "Nobody really wanted to stand up and claim the trochus, because they know everybody knows that the trochus was not here when they were born. It was introduced here, planted here." Reef fish speared off Fedraey. 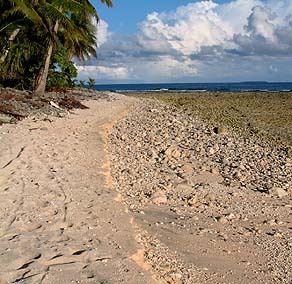 “There are locations on the reef here that are indicators of conditions on other islands. You can tell, if you look to that particular place and it’s rough, then you know, it’s rough over at that island. And if you look at this particular location and it’s calm, then you know, ‘that island is calm.’ So without really going to that island to find out if it’s rough or calm, you can look at certain parts of the reef here and you can tell. “Probably the very first people found this out, probably by a mere accident or whatever, that when they’re heading out and they saw this particular part of the reef and it’s in this type of situation and they reach their islands and it’s in the same type of situations. 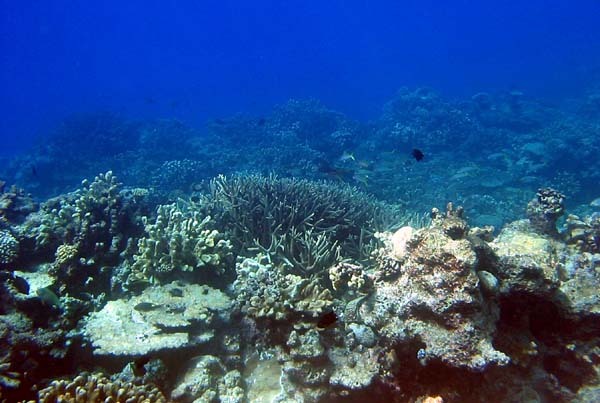 “Tides are associated with the current in the curve of the reef. This part of the lagoon, when the current is going out of this channel, then it is low tide. At the same time, on the other side of the lagoon, the current will be coming into the lagoon. So, coming in through their channels and going out through ours; in on that side, and out on this side. And we both can still say, ‘it’s getting low tide.’ Then when it comes in on our side, and goes out on their side, then it’s starts going up, high tide. Gathering on the reef at low tide. Waves in the channel between Asor (left) and Falalop. “The channels are important in the lagoon," Serphin points out, "because when you have to travel, because some of these channels are dangerous—very rough and strong current. Some of these channels can go fifteen miles per hour, if the weather is not so good. Or four to five miles per hour, incoming and outgoing. “Fishing is the most dangerous close to the channels because you have to know where you can enter or cross the channel, if you fish around, trolling or something like that. "Some of these are too dangerous. 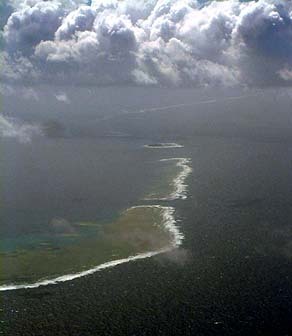 This channel between Feitabul and Fereadaw, this is considered a bad channel in the atoll. And also the one between Ptongeras and Yal’el Weeachiich. These are no good. The currents are moving very fast, and it’s shallow. So sometimes the waves continue from one side all the way down, just rolling. “You can fish on two or three miles away from it because it’s too dangerous nearby, and if you’re bottom fishing, the line won’t go straight to the place where you’re going to fish. So that’s very important to know these channels and the time that you are going out traveling between island to island." Channels in and out of Ulithi Atoll, as identified by Serphin Guior. Channels through the Western reef. “So when you go fishing you have to know the location of the wind and know the place that it will calm, that this channel will calm for you to cross. Especially the western parts, when the wind is coming from the east. But when it’s coming from the north, you’re not going to go fishing because we are expecting typhoon or some cyclone somewhere. “Tide makes a difference. And also, the time of season: summer time, winter time, you have to consider that. Now it’s good because we have boats, but before it’s hard, hard to go, because moving a canoe is very slow. So you have to understand where you go and where you going to tack to in other places and tack to another. Canoes require a lot of tacking." Much more about sea life is discussed on the next page, regarding fishing.